I went shopping earlier this year, to find myself a new t-shirt. I’m very hard to please when it comes to t-shirts, and a good shirt hunt can take me quite a way across the city. On this occasion I happened onto the Firetrap shop at London’s Seven Dials, where I found a nice tailored, black, soft cotton shirt, stitched with a large eagle crest. 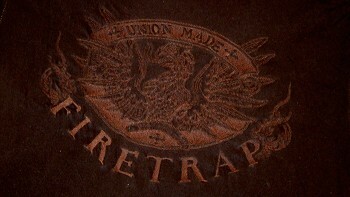 I quite like Firetrap clothes, when I can fit into them, but what really sold me on this one was the legend writ large around the eagle: “Firetrap: Union made”. Now call me cynical, but when I saw the shirt, I didn’t believe it for a second. Also odd was the fact it didn’t even have a label to say where it had been made (not mandatory, but very common). My curiosity had been piqued – I bought the shirt, and on getting home, I tried to contact Firetrap’s PR agency to ask where it came from, and which union had been involved in its manufacture. After a month playing Out-Of-Office ping pong with the agency and the marketing department of WDT, the £65m company behind Firetrap and its sister brands, Sonetti and Full Circle, I got a partial answer. As I suspected, the “union made” slogan had only been a stylistic device, and shouldn’t be taken to mean that actual bona-fide union members had been involved at any point during the shirt’s lifetime (I never got an answer on whether WDT had a code of conduct on labour standards for its subcontracted producers). Indeed I was probably the first time it had come within a mile of a trade unionist. The theme of Firetrap’s collection was “Rebels and Renegades”, and the phrase “union made” was presumably chosen for the shirt as it brought with it an instant air of American faded blue-collar glamour – Bruce Springsteen meets Eight Mile. This strikes me a more than a bit odd though. After all, Firetrap surely wouldn’t have considered even for a moment printing a shirt with a “No sweat” legend, had it been stitched by bullied and battered kids in an East Asian Free Trade Zone. Likewise they’d never print “100% organic cotton” or “Fair Trade” as a slogan on a garment that was drenched in pesticides or had paid the producer only a fraction of what their labour had been worth. So why does “union made” matter so much less as a label that you can take such liberties with it? As a contrast, I was on my way to a conference in the States last year, when I discovered to my horror that moths had done for my only suit, and I had to stop off at a department store to find another. I was genuinely shocked when checking for the size label in a jacket pocket to instead pull out a discrete “UNITE HERE union made” label. I never tire of showing UK unionists my very own trade union suit (and I never forget to use mothballs). Search for “union made clothing” on Google.com, and you pick up 12,500 results. Run the same search on Google.co.uk, and the number is a paltry 48 pages, with most of those discussing events in the States. So the “union made” label is on the way out in America, it seems like it’s never been an issue in the UK at all. In fact, it seems to be such an empty phrase over here that’s it’s little wonder a company might think of misusing it without any qualms. But there does seem to be a new wave of interest in “union made” growing within the UK’s union movement and NGOs – and this time with a different meaning, a long way from domestic protectionism. A look at the ILO’s conventions on labour standards shows up four indivisible human rights. Three of these, the freedom from forced labour (ILO Conventions 29 and 105), freedom from child labour (138 and 182) and the freedom from discrimination at work (100 and 111) are easy for western consumers to understand, and many companies exporting labour to the Free Trade are begrudgingly moving to demand their subcontractors comply with them. The fourth is less immediately obvious; the freedom to form a union and bargain collectively, spelled out in ILO Conventions 87 and 98. This fourth freedom is a crucial one, and in many cases it is the source from which the other three spring. In a world where half the population live on £1 a day, decent work opportunities are crucial to let people raise themselves and their communities out of poverty. But even with western consumer power creating a climate where better work is viable, it won’t come unless the workers themselves are able to organise and demand it themselves. Local unions are the key to getting pressure from both ends of the multinational supply chain, and transforming good intentions into hard results for workers. Good post. I always thought here was a real gap there, with all the fuss about fair trade, organic and so on. A few years ago the South African textile industry was decimated when tariff barriers were removed, and 110 000 workers lost their jobs. The union united with the employers in a ‘buy South African’ campaign, which I think was stupid and reactionary. If they’d gone for ‘union made’ they might even have found a market in the UK. Great post, would be great to get something like this off the ground to compare to ‘fair trade’ labeling.